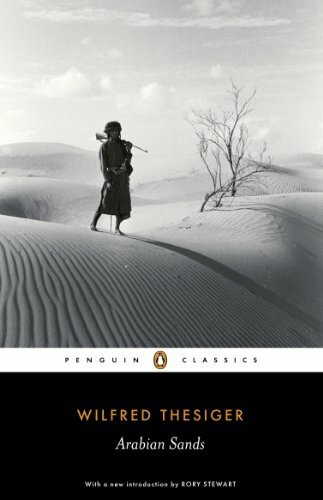 Arabian Sands by Sir Wilfred Thesiger is an all-time classic mostly describing his travels and exploration of The Empty Quarter, Yemen and The Western Sands in Arabia in the mid to late 1940’s. An extremely important and fascinating account of the nomadic Bedouin (the Bedu) and their lifestyle, Arabian Sands exposes the reader to a wealth of information on the people, history, geography and customs of this arid region. Without doubt, Wildred Thesiger is one of the greatest travellers ever. His five years spent living with the Bedu tribes enabled him to explore parts of Saudi Arabia, Yemen, Oman and present day United Arab Emirates that previously had never been visited by westerners. Often, the areas he visited were prohibited to him by Kings and Sheikhs. However, his insatiable thirst to explore these uncharted areas compelled him to experience the hardships and comradeship that travelling through these most inhospitable of terrains provided. Through these regions, Thesiger and his companions constantly battled starvation and thirst and faced the extreme difficulties of travelling through areas where residents would have no compunction in killing any infidel who sought passage through their tribal lands. Arabian Sands is as much memoir as it is an adventure story and covers Thesiger’s early life in Abyssinia (Ethiopia) where he was born and returned to after his schooling in England. Detailing his early ventures into the Danakil region of Ethiopia, where the locals were known to carry the scrotum of people the have killed, sets the scene for Thesiger’s later and more famous exploits and we find that it is his time spent during the war in countries such as Sudan, that Thesiger develops his life-long love of the desert. This sets the foundations for the a number of forays into the desert unknowns, during which Thesiger fully immerses himself into the Bedu lifestyle, forsaking all western comforts and norms and where he is given his Arabic name, Umbarak. Arabian Sands is written with a fair degree of literary simplicity, usually devoting little effort to describing the vistas and hardships that are constantly faced. This is somewhat explained by having been written in 1959 from his earlier diary notes. The writing is very much to the point, suiting the austere desert environment that he travels through and Thesiger easily conveys his love for the region and the people that inhabit it. More pointedly, Thesiger also displays his love for his Rashid travelling companions and provides a moving account and tribute to a traditional society and way of life that has now been lost to the sands of time. Use drop down menu below to sort by blog category type.